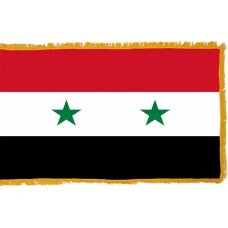 The Syria Flag features three horizontal bands in the colors of red, white, and black. 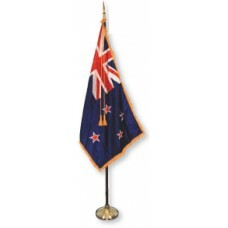 In the center of the white band are two green stars. It is thought that the Syria Flag is based on the Arab Liberation Flag which consisted of four colors that represented the four major dynasties of Arab history. The red color of the flag represents the "Hashemite Dynasty" as well as the struggle and blood-shed for freedom. The white color represents the "Umayyad Dynasty" as well as a bright, hopeful, and peaceful future. The black color represents the ‘Abbasid Dynasty’ as well as the oppression and the green color represents the "Fatimid Dynasty." The two stars, according to some people, represent the union between Syria and Egypt and according to others, they represent Syria and Iraq. 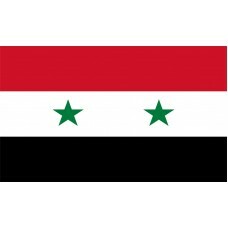 The Syria Flag that is used today was first adopted on February 22nd, 1958 and was used to represent Syria as part of the United Arab Republic. 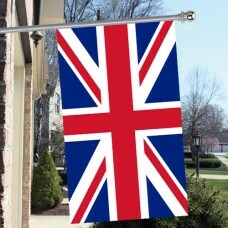 The flag was then abandoned on September 28th, 1961 and re-adopted on March 30th, 1980. Even though it is no longer part of an Arab State Union, the flag was re-adopted to represent Syria's commitment to the Arab union. Syria is a country in the Middle East, in Western Asia and shares borders with Lebanon, Israel, Turkey, Iraq, and Jordan. The capital city of Syria is called Damascus. Damascus is also referred to as "Jasmine City" and is one of the oldest inhabited cities in the world and is home to over 125 monuments representing different periods of Syria's history. One of its renowned monuments is called "Umayyad Mosque" which is also referred to as the "Great Mosque of Damascus" and is the 4th holiest place in Islam as well as one of the largest mosques in the world. An important plateau in Syria which is called "Golan Heights" overlooks four countries and is where Syria, Lebanon, Jordan, and Israel meet. It is often referred to as "Shouting Valley" as relatives from the different parts used to shout across to each other through megaphones. Syria is a county that has endured many years of invasion, war, and conflict and is still currently a major battleground with armies from 34 different countries fighting and using Syria as a base. Syria, in 1500BC was invaded by the Egyptians. It then eventually became part of the Roman Empire as well as the Ottoman Empire. Following WWI, France gained control of Syria until Syria gained independence on April 17th, 1946. Following its independence, Syria encountered many invasions and the country had a lack of political stability, and as a result, became part of the United Arab Republic with Egypt in 1958 until their separation in 1961. From 1970, Hafez al-Assad took power and control of the country and since then, his family have had control of Syria.